shown standing in a calm manner with wise expression on the well-modelled face, wearing a high court headdress and a close-ﬁtting breastplate over court robes with wide sleeves, the long robes falling to the stylized rockwork base, the elaborate fan-shaped toes of his shoes emerging at the hem, the pale buff pottery with extensive remains of original gilding and pigments in red, green, white and black. 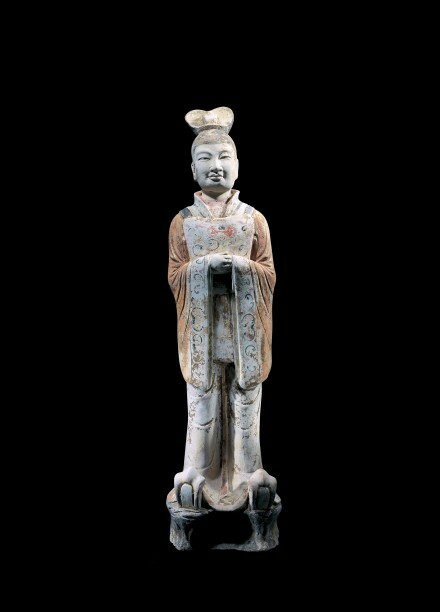 Compare the similar painted pottery ﬁgure of a court dignitary, of smaller size, in the collection of Tenri University Sankokan Museum, Japan, illustrated in exhibition catalogue entitled the exhibition catalogue entitled Zuito no bijutsu (Art of the Sui and Tang Dynasties), Osaka Municipal Museum, Tokyo, 1978, no. 158. Compare also the painted pottery court dignitary of this type, dressed in slightly different court robes, from the Eumorfopoulos Collection, now in the Victoria and Albert Museum, London, illustrated by Ayers in Far Eastern Ceramics in the Victoria and Albert Museum, London, 1980, no. 10.